I am Lady Iona, High Priestess and green witch. For a witch, spirituality is life, and life is art. My art is the wise use of the green. Sink into four days of plants and sisters, nature, magic, and medicine. Join us for a visit to Herb Hill, where you will learn how to harvest and make a variety of herbal tinctures, vinegars, honeys, and oils. Come sit in circle at the Moonlodge. 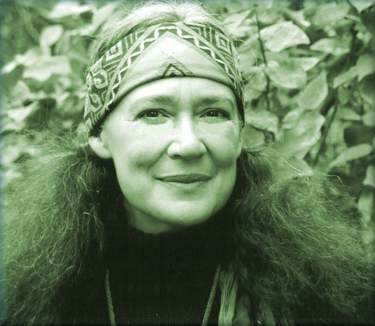 Find out about our history as wise women and witches, shamans and healers. Be present as we create a sacred space for the Initiation of Green Witches. Sing. Dream. Drink nourishing herbal infusion. Participate in daily Talking Stick. Make wild salads. Find yourself, love yourself. No prior herbal knowledge needed. Yes, I want to register for the Green Witch Intensive ! Susun Weed, PO Box 64, Woodstock, NY 12498. Our space is limited. While some classes fill quickly, others are open to the last minute. If registering within two weeks of an event, give us a fax number for confirmation. We answer the phone only on Wednesday and only between 11-4 pm (East coast time). All other times the answering machine is on. You may fax anytime, except on Wednesday. Join Susun for a wild ramble as we encounter and learn how to use the special green allies of spring. We will talk about and taste lots of tonics. We will explore nettle soup, bite buds, pick and eat a wild salad, smell roots, laugh, and think green! Join Susun for a wild ramble as we encounter and learn about ramps, brassicas, dwarf ginseng and rare spring flowers. "The lessons you've given me will be my companions forever." "You are a wonderful teacher and an incredible example." "You opened a grounded, ancient, wise, visionary, magical world to me." Identify , harvest, prepare and use great herbal remedies. Which of the great remedies will we play with today? Nettle, motherwort, red clover, yarrow, burdock, comfrey, plantain, linden, St. Joan's wort, and so many more want our attention. The days are independent, but complementary. As always, we will begin with Talking Stick, break for a wild food lunch around 1pm, and enjoy ourselves immensely. "The simplicity of your approach is amazing and empowering." "I continue to relish the special communion I felt in that amazing circle of Wise Women." Think Better, live longer, feel great, adopt adaptogens. Some herbs are medicine, and some are food. And some change our minds. Throughout the world, magical and mind-altering plants are the first plants studied by those who wish to be healers and helpers. This is one of the hidden secrets of Western herbalism. You don't have to go to Peru to find and use plants that open your mind to the worlds around you. While some are exotic, many grow right around us. In addition to mind-altering plants, we will talk about – and perhaps visit with – the fairies and the plant devas. You will make a dream pillow to take home. We will explore flying ointments, third eye opening tinctures, visionary herbs and love potions. If your expertise has not included this important group of plants, please join us. Beginners will benefit enormously from this class but it is not suitable for children. Experienced herbal folk will find much to delight them in this day. "Your dynamic presence and remarkable story telling make learning fun and easy." Come get your hands dirty as we dig burdock, yellow dock, teasel, dandelion, and/or chicory and make herbal medicines. We will create tinctures and vinegars, dry and infuse roots. We will find ourselves deeply grounded and loving the Earth. As the days shorten and the nights get chilly, plants start to store up medicine and food in their roots. Let's be there to take advantage of these intense medicines. Stories, songs, Talking Stick, and the fairies will be part of our day. Geared toward beginners, this class offers those already experienced interesting new ways of connecting to their roots. Here come colds, the flu, coughs, congestion, sore throats, and all the ways that winter can whomp you. Whomp back with simple, safe, effective herbs. Learn how to tell the difference between hot colds and cold colds, and the best ways to counter them. Encounter the stories and power of elder, mullein, elecampane, sage, honey and more. Learn all about antibacterial, antitiviral, and anti-inflammatory herbs and why they are better by far than essential oils. Bring your questions about sinus infections, bronchitis, laryngitis, pneumonia. A great class for beginners with plenty to excite more experienced folk.